It's been another huge morning of Champions League action. ANOTHER massive morning of UEFA Champions League action has yielded a moment of remarkable drama, some big wins and one huge upset. Cristiano Ronaldo's debut in the competition with Juventus ended after just 28 minutes as he was sent off for pulling an opponent's hair in controversial circumstances - but his teammates forged on to register a 2-0 win over Valencia. While there were big wins for Real Madrid, Manchester United and Bayern Munich as they all began their campaigns in emphatic style. The same couldn't be said of Manchester City, who struggled with Pep Guardiola serving a touchline ban, going down in a shock 2-1 loss to Lyon. 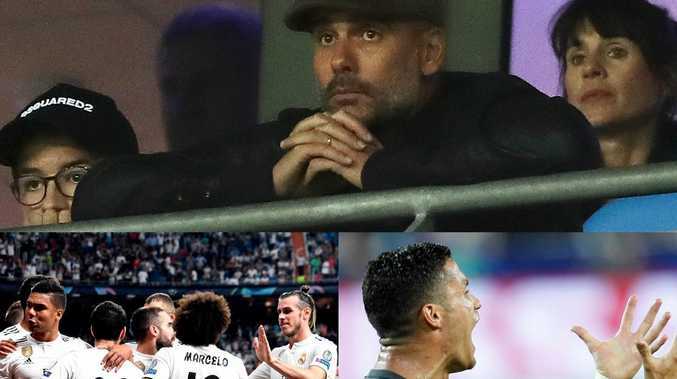 Pep Guardiola had to watch on in horror from the stands due to suspension as Manchester City's Champions League campaign got off to the worst possible start in a 2-1 home loss to Lyon. Maxwel Cornet and Nabil Fekir fired Lyon into a 2-0 half-time lead and despite Bernardo Silva pulling a goal back, City slumped to their first defeat of the season. Life in the Champions League without Cristiano Ronaldo began for Real Madrid with a comfortable 3-0 win over Roma on Wednesday. Francisco "Isco" Alarcon, Gareth Bale and Mariano Diaz took care of the scoring in Ronaldo's absence, securing the opening Group G victory for the three-time defending champions. Madrid is playing the Champions League without Ronaldo for the first time since 2009, when the star forward arrived to lead the club to four European titles. Ronaldo played his first Champions League game for Juventus on Wednesday and was sent off with a straight red card in the first half. It was a disappointing opener for Roma, which is coming off a semifinal appearance last season. Juventus believe they can win the Champions League with Cristiano Ronaldo, but they had to start by beating Valencia 2-0 without him after he was controversially sent off on his debut in the competition for the Italian champions on Wednesday. A tearful Ronaldo left the pitch in disbelief in the 29th minute, having aimed a petulant, but seemingly harmless, kick at Valencia defender Jeison Murillo, prompting referee Felix Brych to brandish the red card. Ronaldo dropped to the ground like the entire tournament was lost, but Juve showed more composure with Miralem Pjanic scoring twice from the penalty spot to clinch a comfortable win. Valencia were even awarded a third spot-kick of the match deep into injury-time but Daniel Parejo missed. Game-winning displays like Paul Pogba's in a 3-0 victory for Manchester United over Young Boys should help to improve his relations with coach Jose Mourinho. Pogba scored twice late in the first half to get United off to a smooth start in the Champions League against the group-stage newcomer. A curling shot in the 35th minute and an assured penalty in the 44th - after a trademark slow-trot approach - showed Pogba at his most elegant. Pogba's form cheered Mourinho on the touchline after an uneasy early season between them since the team's signature player returned from winning the World Cup with France. 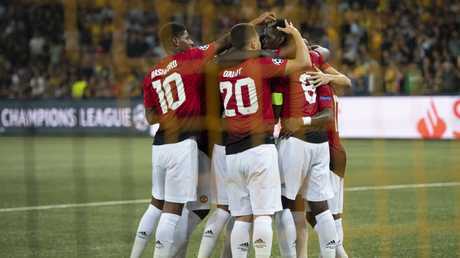 United went three goals up in the 66th when Pogba surged through the midfield and teed up Anthony Martial, who also had tense pre-season exchanges with Mourinho. Martial's shot took a deflection off defender Mohamed Ali Camara. Manchester United's Paul Pogba celebrates a goal with teammates. Renato Sanches scored his first goal for Bayern Munich on his return to Benfica to give the German club a 2-0 win in their Champions League opener on Wednesday. Sanches started and finished a well-worked move to net Bayern's second goal in the 54th minute. He first powered his way through the midfield and passed to Robert Lewandowski on the left. The ball made its way to Franck Ribery and James Rodriguez, who crossed for Sanches to score from close range. The Portuguese midfielder was making his first start for Bayern since returning from a season on loan at Swansea. Lewandowski had given the five-time European champions an early lead, converting Bayern's first real chance after Ribery and David Alaba combined to set him up. Arjen Robben could have added to the score minutes later but failed to beat Benfica goalkeeper Odisseas Vlachodimos in a one-on-one. He was denied again five minutes before the break, when Vlachodimos deflected the Dutch winger's effort over the bar. Eduardo Salvio had the home side's best chance of the half, but Bayern goalkeeper Manuel Neuer saved his shot. Sanches, who moved from Benfica to Bayern after the 2016 European Championship, ended his former side's hopes of an upset and gave Bayern coach Niko Kovac a winning start on his debut in the competition. Defender Nicolas Tagliafico scored twice Wednesday as Ajax celebrated its return to Champions League football with an emphatic 3-0 victory over AEK Athens at the recently renamed Johan Cruyff Arena. After dominating possession but failing to score in the first half, Argentina defender Tagliafico broke the deadlock just after the break and made it 3-0 in the 90th minute with an effort from an acute angle on the left that sailed over AEK goalkeeper Vassilis Barkas and into the goal. In between, substitute Donny van de Beek doubled Ajax's lead with a powerful close-range volley in the 77th. It was four-time European champion Ajax's first appearance in the Champions League in four years, while AEK was playing in Europe's top club competition for the first time in more than a decade. Ajax dominated possession but failed to create a meaningful chance in the first half. That changed inside a minute after the break when a corner fell to David Neres, who scooped the ball into the penalty area where Tagliafico calmly slotted the ball under Barkas. Van de Beek made it 2-0 by volleying past Barkas after a cross from the right by Dusan Tadic before Tagliafico completed the scoring with his spectacular effort from the left. AEK defended in numbers and looked dangerous on the break in the first half against a makeshift Ajax defence that saw midfielder Frenkie de Jong replacing injured captain Matthijs de Ligt at center back alongside Daley Blind. But the Greek champion was outplayed after the break and rarely threatened. The youngest coach in Champions League history drew his debut game as Hoffenheim's match at Shakhtar Donetsk finished 2-2. The 31-year-old Julian Nagelsmann had to wait just six minutes to see his team score a first Champions League goal as Florian Grillitsch put Hoffenheim 1-0 up. However, Shakhtar responded with a solo effort from Ismaily in the 27th as the Brazilian charged down the left flank before leaving defender Havard Nordtveit sprawling as he cut inside and placed a shot inside the far post. Nordtveit restored Hoffenheim's lead with a header in the 38th after a corner and teammate Andrej Kramaric came close to scoring a third in the second half. However, Maycon's long-range shot in the 81st minute for Shakhtar meant the teams shared the points in Group F after a frantic finish in which Hoffenheim held off a Shakhtar onslaught. Nagelsmann, who turned 31 in July, took over at Hoffenheim in February 2016 at the age of 28 and qualified the team for the Champions League last season for the first time in its history by finishing third in the Bundesliga. He's a month younger than Belarusian Viktor Goncharenko was when he coached BATE Borisov against Real Madrid in the Champions League in 2008. While Hoffenheim traces its history back to 1899, it's a young club at the elite level. The team languished in the German amateur leagues before software billionaire Dietmar Hopp began to put large sums into the club starting from 2000, taking it to the Bundesliga in just eight years. 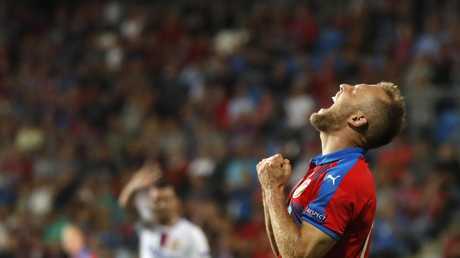 CSKA Moscow salvaged a 2-2 draw with Viktoria Plzen after a penalty deep in stoppage time. Plzen was leading 2-1 on goals by Michael Krmencik before Jan Kovarik's foul gave CSKA a spot-kick, which was duly converted by Nikola Vlasic. Krmencik scored the opening goal in the 29th minute at a free kick off a header from Radim Reznik and added his second from David Limbersky's cross 12 minutes later. CSKA came back into contention in the second half when Vlasic crossed for Fedor Chalov to score in the 49th. CSKA twice thought it had equalised in the latter stages but one effort was ruled out for offside and the other for a foul in the buildup. When Plzen and CSKA last shared a Champions League group in 2013-14, the presence of Bayern Munich and Manchester City meant their two meetings were a fight for third place, which Plzen narrowly won.